The only time a bride gets to let her hair down and have all the fun and masti with her gal-pals is during her pre-wedding celebrations, especially mehndi ki raat. Slowly, steadily and sneakily the mehndi ceremony has transformed into the most fun pre-wedding celebration. While some like to celebrate this occasion lavishly, some like to keep it low key by hosting their mehndi ceremony at home, on the terrace or in their backyard. For those pataka guddi brides who’re looking to completely cut short their wedding budget and are planning to get on the do-it-yourself (DIY) bandwagon, some elementary and effortless ideas that have become the biggest trend this year are coming your way. Gather your bridal party and get inventive. These DIY mehndi function decoration ideas include items that you can either find lying around in your home or buy them on wholesale at dirt cheap rates. These super colourful inspirations are guaranteed to boost your creativity keeda and introduce captivating charm at your mehndi function décor that may become the highlight of your wedding ceremony. Who needs chairs, when you have colourful gaddas at home? Match all your cushions and use simple flower decoration to beautify the space. Their interesting chandelier structure enables kalires to play double duty as a beautiful decor item too. Use them as a whole or break them apart to align them as streamers or hangings paired with strings of flowers. Think colour, colour and lots of colour! Don’t worry about them going waste. You can either take a trunk full of bangles in your trousseau or give these away to your attendees as a mehndi ceremony favour. Find out how the big bangles theory unfolds! If having a mehndi celebration indoor, create your own gorgeous wall or paranda ceiling. For outdoor decor, all you need to do is find a tree and hang these colourful parandas with strings of genda phool wrapped around the tree or hanging loose. Relive your school days by creating your own pinwheels or origami cranes and fill the space with your creativity. More colourful, the better! Now that you’ve unleashed your creative self, why let the M.F.Hussain in you stay hidden. Get artistic grabbing cute little kettles and painting them the way you like it. An extremely earthy yet fun DIY mehndi decoration idea is the Rajashthani Kathputlhi or puppets. Don’t fret looking at their structure. They’re not all that difficult to create. The magic here is in the bandhini material and the dolls don’t necessarily need to look perfect. Using colourful Indian umbrellas is the most effortless way to deck up your mehndi ceremony. 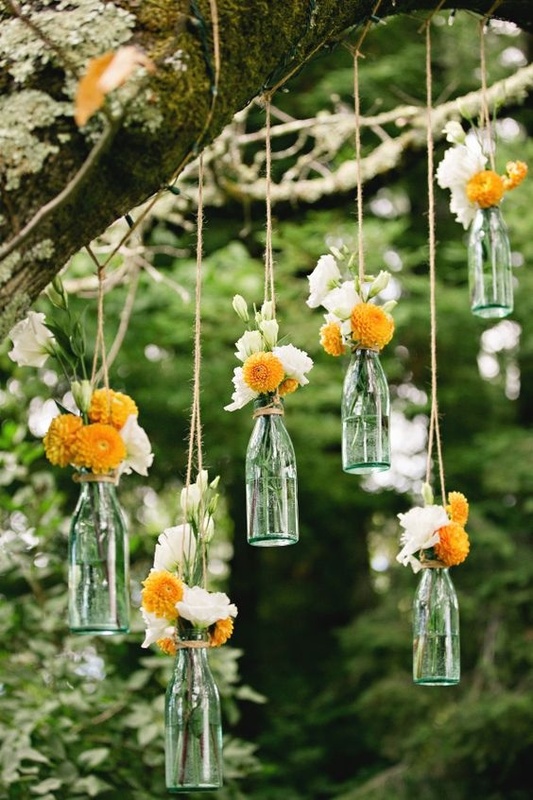 Hang in some strings of genda phool within the rim of the umbrella or simply place them around your home or venue, either way they transform the space magically. Call up all your buddies who love to binge on vine and beer, and there you have your mehndi decoration item. All you got to do now is just get the stink off, fill the bottles up with water and place some amazingly fresh and gorgeous flowers in these bottles. Hang them by a tree or place them on tables, either way they’re sure to fancy up your venue and grab some eyeballs. Having a vintage themed mehndi ceremony? Birdcage decor is the most unique, eye-catching and stylish decoration item. Throw in a bunch of flowers in them, that’s all it takes to dress these beauties. If you wish to fancy the decor up a little, you can add some crystal strings. Contrary to bird cages, candles are the cheapest of all DIY mehndi decoration ideas you can come across. Use the variant sizes they are available in the market and get creative. Another stunning way to include candles in your mehndi decoration is by placing them in or around an ornamental earthen pot filled with flower petals. Oh, wait! That’s not all. We’ve got some more ideas for you here.